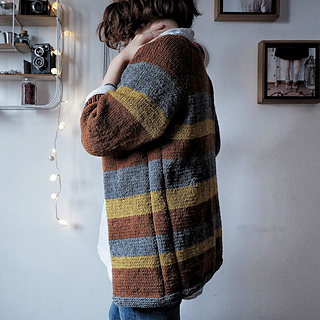 Chamomile cardigan is perfect for cozy cold days spent at home or to wear when the autumn days start to become colder. It’s quite simple to knit, you can work on it while enjoying a good movie or while you’re having a knitting evening with some friends. 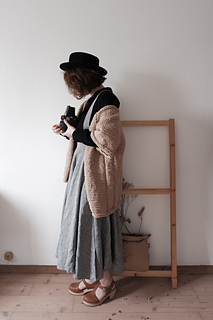 It’s a one size fits all, inspired by the Japanese kimono for the large sleeves. 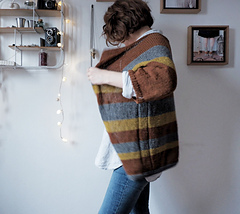 The peculiarity of this cardigan is the colour work. I used an autumnal palette for this winter version, but you can play with colours and make it more minimal or more crazy. Chamomile is worked from the top down, without any seam. If you want, you can adjust the underarms with a couple of stitches. You will start from the collar ribbing, then the body and the first rows for the sleeves; the sleeves are put on hold and you will knit the rest of the body. 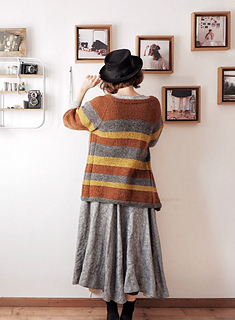 The last thing you will knit are the sleeves, but they are short and quick to work. 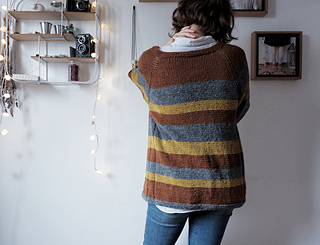 In the pattern you will also find the instructions to make the cardigan with a chunky yarn.